Kräusening reduces diacetyl and can help attenuate a beer. Running a lager fermentation is, in many ways, similar to conducting the fermentation of an ale. The key differences are that you need to pitch more yeast, ferment at a cooler temperature, and cold-condition (lager) the beer after primary fermentation. In addition, sometimes you need to alter the conditions near the end of fermentation to produce a quality beer. Specifically, many lager strains will not adequately clean up the residual diacetyl (and other fermentation byproducts) if they are simply left to finish at their recommended fermentation temperature. For most homebrewers (and many commercial brewers), the solution is to employ a diacetyl rest. Near the end of fermentation, the fermentation temperature is allowed to rise into the low end of the ale fermentation range. The beer is held at that temperature until the diacetyl is gone. Commercial breweries test for this; most homebrewers simply let the beer sit on the yeast for about 3 days, at around 60 °F (16 °C), which is usually long enough. There is another way to finish off a lager fermentation, however — by kräusening it. In this three-part article, I’ll discuss kräusening and one option that arises when you employ it — the ability to cap the tank and carbonate your beer from CO2 generated in late fermentation. Kräusening is adding a small volume of actively fermenting wort to beer that has just finished fermenting. The active yeast help finish the fermentation, potentially increasing attenuation and scrubbing the beer of its diacetyl. An added benefit for commercial brewers is that they can cap their tanks (seal the fermentation vessel) and retain the last bit of carbon dioxide produced by the yeast. That way, the beer will be carbonated when it is lagered. A boost in attenuation is most welcome when brewing a very strong lager. The commercial version of Samichlaus, the 14% lager brewed for the Christmas season, is kräusened for this reason. (And, you can do this for the homebrewed version, too.) If you’re brewing a doppelbock or other strong lager, this is a good reason to employ kräusening as opposed to a diacetyl rest (although the two aren’t mutually exclusive). For commercial brewers, there is an additional benefit to kräusening — filling tank space. Commercial fermentation vessels are typically initially filled to around 80% of their capacity. This leaves headspace for the kräusen to rise during fermentation. Once primary fermentation is winding down and the kräusen falls into the beer, that space is empty. Kräusening — in addition to the benefits it provides for the beer — helps commercial brewers increase their output by filling their tanks nearly completely. 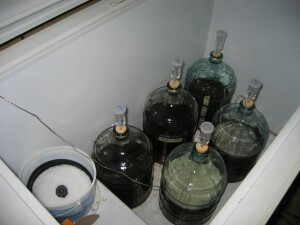 The biggest disadvantage for homebrewers is generating the fermenting kräusen beer. Essentially, you need to make a little batch of beer to finish your big batch of beer. (And you already had to make a big yeast starter before your brewday.) At a commercial lager brewery, finding fermenting lager beer is not a problem. At a homebrewery, you’ll need to make it. Kräusening your beer takes more effort than performing a diacetyl rest. However, for homebrewers who frequently make lagers, it’s worth trying to see if you notice a positive difference in your beer. To me, a lot of homebrewed lagers — including my own, non-kräusened ones — have a distinctive “homebrew lager taste.” (It’s hard describe, but it’s a “fullness” to the beer that prevents it from having the”zing” or crispness of a great lager. It’s different than the slick, mouth-coating, caramel/butterscotch character of residual diacetyl.). The few lagers I’ve kräusened have lacked this flavor and, I thought, tasted more like a quality commercial lagered beer. As a data point, back when I was entering homebrew contests, my kräusened Vienna lager won a silver medal at the NHC. That’s admitted anecdotal support for the technique — and I’m not trying to be “that guy” who is always going on about the medal he won years ago — but I do advocate that enthusiastic lager brewers give this traditional technique a try in their home brewery. In the remaining parts of this article, I’ll discuss how to kräusen in your home brewery and carbonating your beer via kräusening. I look forward to the rest of this article. I am planning on doing a pilsner this weekend and maybe I could try to incorporate this technique. I am brewing a light lager on Jan. 24 and this article has certainly got my attention. Great timing on this. I have several lagers scheduled in the next couple of months, so I’ll have to give this a try. If you have several lagers planned, you could potentially make one batch of kräusen wort and kräusen them all at the same time. You’d have to plan ahead a little, but it could be done. You could also make a slightly larger batch of wort at the beginning, and reserve some for krausening, but you would have to be extremely careful in your wort-handling. I have heard of people keeping wort for quite some time by filling a container while still boiling and sealing- the aussie no-chill method. Some brewers claim it will keep for months this way if stored properly. Canning with a pressure cooker is probably the more fool-proof method, but most people don’t have those laying about.